On Monday July 1, 2013, I’ll be back in Pima County Justice Court defending myself against a bogus traffic citation issued on March 29, 2013 at the SR-86 Milepost 146.6 CBP roadblock. The citation was issued by Pima County Sheriff Deputy Thomas Audetat, badge #6312, at the beheadst of CBP Agent J Grayson for allegedly stopping unnecessarily in the highway, a violation of ARS 28-871A. This despite the fact, I was stopped in accordance with two stop signs placed in the highway and by CBP agents who ordered me to stop. Deputy Audetat wasn’t interested in hearing the facts however given that he was on special assignment with CBP via Operation Stonegarden, a federal program which, amongst other things, pays local law enforcement officers time and a half to be at the beck and call of federal agents harassing domestic traffic inside the country. If all this sounds familiar, that’s because it is. Back in 2009, I was similarly harassed by TOPD Officer Carrasco who was responding to a call for assistance from CBP Agent Roman at this same roadblock complaining about me blocking traffic while detaining me in that same lane of traffic. Carrasco obeyed his federal handlers and wrote me a citation for impeding traffic, a citation I quickly dispensed with in court a few months later. In anticipation of the upcoming civil traffic hearing, I submitted a Motion To Dismiss last week. Feel free to read the motion for more details regarding this incident. I’ll be writing more about the incident in the near future but the motion provides a good overview of what to expect & reveals the ridiculous nature of the alleged violation. Defendant, Terrence Bressi, representing himself, hereby moves this Court to dismiss the single charge alleged against him of Stopping, standing, or parking outside business or residence district in violation of ARS 28-871(A). In the event a ruling is not made on this motion prior to the currently scheduled hearing on July 1, 2013, oral argument on the motion at the start of the hearing is requested. 1.) The statutory language Defendant is alleged with violating doesn’t prohibit stopping, standing or parking where Defendant was cited. 2.) The statute Defendant is alleged to have violated has no legal effect within the boundaries of a federal roadblock while being detained by federal agents for federal immigration purposes. 3.) Defendant was being illegally detained by federal agents in the lane of traffic at the time & place of the alleged violation. In early January of 2008, Customs & Border Protection (CBP) under the Department of Homeland Security (DHS) erected an inland non-permanent tactical roadblock along SR-86 in Southern Arizona near Milepost 145. In 2010, CBP moved the roadblock to its current location near Milepost 146.6. SR-86 is an East-West running highway over forty miles North of the international border with Mexico that never intersects the border at any point. As such, the roadblock is considered an inland roadblock because it is neither located at the actual border nor its functional equivalent. At inland roadblocks, CBP agents have far less legal authority to detain & search then they do at the actual border or its functional equivalent (see United States v. Martinez-Fuerte – 428 U.S. 543, United States v. Ortiz – 422 U.S. 891). Defendant has routinely traveled along the SR-86 corridor since 1993 while going to and from his work site no where near the border. Since its inception in 2008, Defendant estimates he has been seized & detained absent individualized suspicion by CBP agents at the roadblock approximately 300 times while traveling from work (only East-bound traffic is routinely forced to stop at the roadblock). Defendant’s exercise of his rights in this manner has resulted in him becoming well known at this roadblock by CBP. It has also resulted in him being the target of harassment by some CBP agents on a recurring basis. One such incident resulting in a similar citation (see case #TR09-001179) as the one currently before this court, was adjudicated on April 10, 2009. During that incident, Defendant was similarly detained by CBP agents in the lane of traffic at this same roadblock. Then as now, CBP agents sought the assistance of local law enforcement to harass Defendant by requesting that local law enforcement find a reason to cite Defendant. Shortly thereafter, Defendant was charged with a single count of impeding the flow of traffic under 28-704(A) by TOPD Officer Carrasco. During the hearing, the presiding judge dismissed the charge on the basis that the statute Defendant was charged with violating was improperly applied given the presence of the federal roadblock (see attachment #1). The alleged violation currently before the court is based on a similar set of circumstances. At no time during the initial stop did Agent Grayson or McKnight give Defendant any instructions, ask Defendant any immigration related questions or attempt to look over Defendant’s vehicle making it clear that the agents were detaining Defendant for purposes having nothing to do with the stated primary purpose of the roadblock – namely immigration enforcement. Having never experienced this type of unprofessional behavior at the roadblock before, Defendant beeped the vehicle’s horn in the hope’s of getting the attention of Agent Grayson and McKnight’s supervisor sitting underneath a nearby canopy as the agents continued recording him. BP supervisor Brandon looked over momentarily and waved but appeared to take no interest in the unprofessional and, quite possibly, illegal actions of his subordinates at the primary stop location. Given that Agent Grayson & McKnight obviously knew who Defendant was and were more interested in harassing him then visually inspecting the exterior of Defendant’s vehicle or asking him any immigration-related questions, Defendant made it clear he wished to go on his way by slowly moving his vehicle forward while Agent’s Grayson and McKnight continued recording him. As soon as Defendant’s vehicle began moving, Agent Grayson yelled for defendant to stop despite having no legal basis to continue the detention given that Grayson knew Defendant and his immigration status. Defendant quickly stopped his vehicle & Grayson stormed up to Defendant while barking conflicting orders in short succession. First, Grayson ordered Defendant to back his vehicle up but Grayson’s supervisor had stood up and was starting to walk towards the rear of Defendant’s vehicle and Defendant didn’t have a clear line of sight to backup safely. Agent Grayson then pointed towards secondary inspection off to the side of the road & slightly behind defendant’s vehicle on the passenger side while yelling, “pull it over” multiple times. Seeing his supervisor approaching the scene, Agent Grayson was also hastily trying to obscure the recording device he had used to videotape Defendant at primary by placing it back in his shirt pocket. Agent Grayson then indicated that, ‘he could do this all day long’ while pointing to the secondary inspection area despite the presence of another CBP agent standing next to Defendant’s vehicle making it unsafe to move in that direction. Additionally, there was a CBP vehicle located along the shoulder of the road slightly ahead of Defendant’s vehicle preventing Defendant from pulling off the road without moving forward past the vehicle first. All of this had transpired very quickly with only about one minute having passed from the time of Defendant’s initial stop until Agent Grayson began radioing dispatch for assistance from the Pima County Sheriff’s Dept. (PCSD). About two minutes after Grayson radioed dispatch, sheriff’s deputy T. Audetat arrived onscene. After speaking to the CBP agents, Deputy Audetat approached Defendant and asked why he was stopped in the road. Defendant told him he was ordered to stop by federal agents and that they were not allowing him to go on his way. A brief discussion with Deputy Audetat followed in which the deputy asked Defendant to pull his vehicle off to the side of the road. The Defendant did so at which point Deputy Audetat walked back to the CBP agents for further collaboration. A few minutes after Defendant pulled off to the side of the road, CBP Supervisor Brandon approached him and stated that CBP’s inspection of Defendant was complete despite the fact they had made no attempt to look over Defendant’s vehicle or ask Defendant any immigration-related questions. This further highlighted the dubious nature of Defendant’s detention and Agent Grayson’s actions. If Agent Grayson had a lawful reason for extending Defendant’s detention while directing him to secondary inspection, that reason had not been satisfied merely because Deputy Audetat had arrived onscene. The primary reason for the extended detention and the presence of Deputy Audetat quickly became apparent however when Supervisor Brandon told Defendant that even though CBP’s ‘inspection’ was complete, he still wasn’t free to leave because the deputy was going to write Defendant a citation for impeding traffic. Several minutes later, Deputy Vatterrodt, Badge #6111, approached Defendant and requested his driver’s license. Defendant is unsure when Deputy Vatterrodt arrived onscene. Soon after, Deputy Audetat issued a citation for allegedly violating ARS 28-871(A). Defendant asked the deputy how such a citation could be valid considering Defendant had been stopped next to a stop sign while being detained by federal agents at a federal roadblock specifically designed to stop cars in the lane of traffic. Deputy Audetat merely indicated Defendant would have to raise the issue in court if he disagreed with the citation. Defendant then requested the names & badge numbers of both deputies along with the names of the CBP agents present at the roadblock. Deputy Audetat & Vatterrodt provided their information and then had CBP Agent Grayson come over to speak to Defendant. While speaking to Defendant, Agent Grayson admitted he knew Defendant along with Defendant’s immigration status. He then told Defendant that in past encounters he had just waved Defendant through the roadblock because he knew who he was but this time around he decided to detain Defendant at the roadblock to videotape him because Defendant was videotaping Agent Grayson. After leaving the scene and checking his records, Defendant did indeed identify four previous roadblock encounters involving Agent Grayson. These previous encounters spanned a three year time frame and took place on March 6, 2010, November 18, 2012, January 5, 2013 & March 3, 2013. After Defendant finished talking with Agent Brandon, he left the scene. Defendant is charged with violating ARS 28-871(A) for allegedly stopping, standing or parking on a highway outside a business or residential district. ARS 28-871(A) is a statute that prohibits stopping, standing or parking in certain locations. The statute does not address the amount of time an individual may stop in a location in which stopping, standing or parking is otherwise permissible and it does not apply to scenarios in which an individual has been compelled to stop by a traffic control device or by government agents. Additionally, given that ARS 28-871(A) doesn’t explicitly prohibit stopping, standing or parking in all places under all circumstances, if the statute stood alone it would be void on its face due to vagueness. The statute does not stand alone however. To find out where exactly an individual is prohibited from stopping, standing or parking and under what circumstances, one needs to look to ARS 28-873 where the specifics are defined. ARS 28-873 states any prohibitions don’t include circumstances in which an individual is in compliance with the law, the directions of a police officer or complying with a traffic control device. Additionally, ARS 28-873 only prohibits stopping, standing or parking along sidewalks, in front of driveways, in intersections, near fire hydrants, on or near crosswalks, near flashing safety beacons, near safety zones, near railroad crossings, near fire stations, near road excavation sites, on bridges, on controlled access highways, etc. Defendant was located no where near any of the locations referenced in the statute however. Indeed, Defendant was located at Milepost 146.6 along SR-86 in Southern Arizona within the boundaries of a federal DHS/CBP roadblock where one of the fundamental purposes of the roadblock is, in fact, to stop all vehicular traffic on the highway. In stopping, Defendant was complying with a traffic control device along with federal agents who were stopping & seizing all Eastbound traffic within the boundaries of a federal roadblock. ARS 28-871 is an Arizona statute that regulates highway use along Arizona highways and therefore, by default, falls outside the lawful enforcement scope of CBP/BP agents operating federal roadblocks along state highways. ARS 28-871 and related statutes make no reference to circumstances surrounding individuals being compelled to stop in the lane of traffic by federal agents operating federal roadblocks along Arizona highways. Indeed, there is no explicit statutory authority in Arizona for conducting roadblocks along Arizona highways by any agency for any reason – be it a local, state or federal agency. Nonetheless ARS 28-873 does make reference to directions given by ‘police officers’. To analyze this however, we must first determine whether or not CBP agents operating federal roadblocks along Arizona highways are ‘police officers’ for purposes of the statute. In Arizona, only peace officers have the authority to direct or regulate traffic or make arrests for violations of traffic rules along Arizona highways. Under normal conditions, federal agents operating in Arizona do not possess Arizona peace officer powers which means they have no inherent authority to direct or regulate traffic or make arrests for traffic-related violations. To lawfully possess such powers, they must first be cross-certified by the sheriff in the county they’re operating in. See ARS 13-3875 regarding cross-certification of federal peace officers. To determine whether or not the agents at the roadblock had such powers, Defendant submitted a public records request to Arizona’s Peace Officer Standards & Training Board (AZ POST) on April 4, 2013 (see attachment #3). The documentation Defendant received in response to his request revealed that none of the federal agents Defendant was forced to interact with at the federal checkpoint on March 29, 2013 were cross-certified by Sheriff Dupnik (see attachment #4). As such, none of the interaction Defendant had at the roadblock in question has any relevance regarding ARS 28-871(A). The only directions given to Defendant by a peace officer with authority to direct or regulate traffic in Arizona on March 29, 2013 came from Deputy Audetat and Defendant complied with Audetat’s directions. Given that ARS 28-871(A) & 28-873 make no reference to federal roadblock scenarios and create no special exceptions for them, it could be construed that every time a federal agent instructs a person to stop at a federal roadblock, the federal agent is in fact violating ARS 28-871(A). A more palatable interpretation for the court however is that ARS 28-871(A) has no business being applied in circumstances where an individual has been stopped and detained by federal agents for federal purposes within the boundaries of a federal roadblock. Indeed, a determination that the state may intercede on behalf of federal agents who seize individuals in the lane of traffic by citing individuals compelled to stop for, in fact, stopping would be counter-productive at best. In the event the court is unpersuaded by Defendant’s arguments that ARS 28-871(A) and supporting statutes do not prohibit Defendant from stopping where he was stopped and are not applicable within the boundaries of a federal roadblock in which federal agents are detaining individuals in the lane of traffic, then the court must consider whether Defendant was being illegally detained by federal agents given that Defendant was not stopped voluntarily in the lane of traffic. In this case, agents knew who Defendant was, knew his immigration status and had no consent or probable cause to extend the detention for any other purpose. In authorizing certain types of roadblock operations, SCOTUS indicated any stops at such roadblocks had to be limited to brief immigration queries with any further detention based on consent or probable cause. In the case before this court, Agent Grayson knew exactly who Defendant was before he even came to a stop and referred to Defendant by name within seconds of him stopping. Given these exchanges between Defendant and Agent Grayson along with his supervisor, it’s clear Agent Grayson had no legal basis for continuing to hold Defendant at primary after he recognized Defendant. It’s also clear that Agent Grayson’s actions were not based on any existing CBP policy or guidelines and that his supervisor did not approve of Agent Grayson’s or McKnight’s actions. As such, it’s also clear Defendant was being illegally seized by Agent Grayson in the lane of traffic so that Agent Grayson could use his authority to act out his personal animosity towards Defendant under color of law. If Agent Grayson had not engaged in this illegal behavior, Defendant would not have been stopped in the lane of traffic when deputy Audetat arrived. Indeed, deputy Audetat would never have been called to the roadblock to begin with. Under AZ law at ARS 28-332 & 28-363, AZ DOT has exclusive control and jurisdiction over state highways. Based upon these statutes along with rules and regulations promulgated by AZ DOT, CBP is required to apply for an encroachment permit before operating a federal roadblock along a state highway. Additionally, the agency is required to keep a copy of that permit at the roadblock at all times, abide by all conditions attached to the permit and renew the permit annually. Defendant has been traveling through this roadblock since its inception in January of 2008 on a regular basis at all manner of dates and times. Defendant is also aware of several other individuals who travel through the roadblock on a regular basis to get to and from their work site. In violation of the restrictions imposed on CBP roadblock operations by AZ DOT, the roadblock has been in operation continuously twenty four hours a day, seven days a week since it’s inception. The encroachment permit only allows operation on irregular dates and for irregular periods of time however. Given that CBP is in violation of the terms of the encroachment permit issued to it covering the date Defendant was cited, the detention of Defendant at the roadblock by Agent Grayson for any amount of time or for any reason on March 29, 2013 was illegal for purposes of Title 28 of Arizona’s Revised Statutes. On May 16, 2013 after Defendant passed through this same roadblock, Defendant pulled over on the outskirts of the roadblock to talk with a PCSD Deputy who appeared to be stationed on the North side of the roadblock. During the ensuing conversation where Defendant inquired as to what the PCSD was doing at the roadblock, Deputy Wren (Badge #6315) indicated that it was a joint operation, that the PCSD was being paid from a federal grant to assist CBP with their operations in Pima County and that she was specifically being paid from that grant on that day to be there for an eight hour shift. Deputy Wren also indicated that she was there for general law enforcement concerns that fell under her jurisdiction such as speeding and other traffic violations along with writing citations for things like marijuana possession if discovered by agents at the roadblock. When Defendant submitted a Public Records request to the PCSD for a copy of the federal grant referred to by Deputy Wren amongst other documentation (see attachment #7), Defendant was told there were no records responsive to his request (see attachment #8) even though the records personnel Defendant talked with admitted there was a federal grant currently in effect between DHS and the PCSD. Defendant has since made additional Public Records requests to the PCSD for copies of the records improperly withheld but is still waiting for the PCSD’s response to those requests (see attachment #9). The existence of this federal grant between DHS/CBP and the PCSD provides a plausible explanation of why deputy Audetat was so quick to respond to Agent Grayson’s call and ready and willing to cite Defendant at the beheadst of Agent Grayson for allegedly stopping illegally in the lane of traffic despite the fact all East-bound traffic was being compelled to stop in the first place. On March 29, 2013, Defendant was cited by PCSD Deputy Audetat with allegedly, “stopping unnecessarily on hwy” in violation of ARS 28-871(A) (see attachment #10). A cursory review of the facts surrounding the alleged violation however show that no such violation of ARS 28-871(A) took place or could have taken place given the location of the alleged violation and the wording of the statute. Specifically, the location Defendant was alleged to have illegally stopped was within the boundaries of a federal roadblock in which Defendant stopped while complying with a traffic control device placed in the lane of traffic and was subsequently detained by federal agents. These facts in and of themselves invalidate the application of ARS 28-871(A) against Defendant since Defendant was not stopped voluntarily and the State of Arizona has obviously seen fit to allow federal agents to setup a federal roadblock and stop traffic at the location where Defendant was cited. Further, the specific exceptions and prohibitions defined in ARS 28-873 for stopping, standing or parking along AZ roads do not support a charge under ARS 28-871(A), no CBP agent at the roadblock was cross-certified to enforce state law and CBP is currently in violation of the encroachment permit issued to it for the roadblock in question. Finally, Defendant’s detention at the roadblock by Agent Grayson was illegal to begin with given the fact that roadblock seizures must be limited in scope and intrusiveness. Agent Grayson failed to limit the stop’s scope & intrusiveness when he continued to detain Defendant to record him with a personal cell phone despite having no legitimate suspicions regarding Defendant’s immigration status. Further, by entering into a formal agreement with the PCSD via a federal grant that pays sheriff deputies to provide assistance at the roadblock for general law enforcement duties, the scope of the roadblock has been expanded outside lawful parameters. Given these facts, Defendant requests that this court grant Defendant’s Motion to Dismiss, or failing that, allow oral argument regarding the motion during the hearing scheduled for July 1, 2013. Respectfully submitted this __ day of June, 2013. 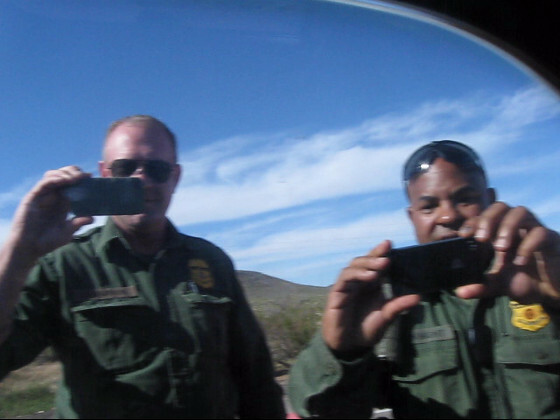 Previous Previous post: Border Patrol Agents with Personal Agendas….